As I'm waiting for the last bits of water damage to be repaired at our shore place, Ive been thinking about how I want to update the living room. The biggest question mark was what should I hang on the walls - specifically over the couch. I was leaning toward some kind of vintage signage but I'm not too keen on shelling out the dough for something large enough that would suit. 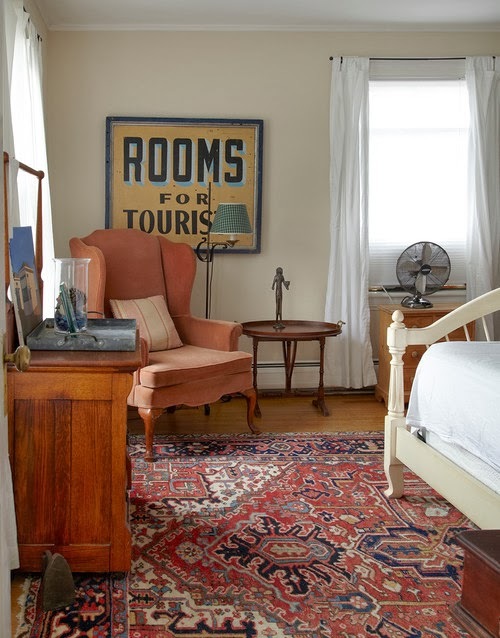 I spotted this image and was digging the Rooms for Tourists sign but I'm not too sure if I could recreate it on the cheap. Well guess what appeared on garbage day? Two huge wood frames!! Thanks to my neighbors who parted with them, they are sitting in my hallway taking up way too much room, waiting for their destiny. Is that a sign or what? So I guess I'll try my hand at making a reproduction sign. What do you think of the "rooms for tourists" wording? Anything more appropriate for a living room by the beach? I could use your suggestions/inspiration. Love it when that happens! Room for Tourists could work, or you could do something like "Beach Bums Welcome" or "Seas the Day." How have I never heard "Seas the Day" before? That is hilarious. I vote for "Seas the Day"! That is pure genius!! Nice score! I like Room for Tourists...or Rooms for Rent...No Vacancy (with the letters divided on each line)...whatever you do will be perfect. those passport invites are the coolest i've ever seen!! Oh! I love it! Etsy has some really good designs for reproduction signs that are always fun to look through. I live in the Mountain's and just finished making a reproduction sign that says 'mountain views'. I actually see the original every time I drive to the store. Lowe's makes crackle paint that when used sparingly really helps to add authenticity. I made a wooden floor prop for when I photograph babies and I've had clients ask where I got the old wood from to make it. You can see it here-- http://www.breatheeasyphoto.com/#!babies-and-bellies/cqvq --hope that was somewhat helpful, I was thinking about doing a tutorial on how to get different looks with different paint colors soon. Do you mind sharing your mountain views sign? I'd love to see how it looks. How's about "Seaside Cottage for Rent"- I picture it in a script...can't wait to see what you come up with! What about "The Sand Castle"? Regardless I can't wait to see how it turns out. I love it when things just fall into place. Can't wait to see what you come up with, it will be all you. I came across these in a magazine and they reminded me of your project (Here's the link: http://www.flickr.com/photos/7886222@N07/12105437904/). I love how they look like pieces of the signs, with the type cropped. I was also thinking FISH BAIT or FRESH CATCH would be cute too. Oh I wish I had a beach cottage to decorate. Until then, I will live vicariously through you!